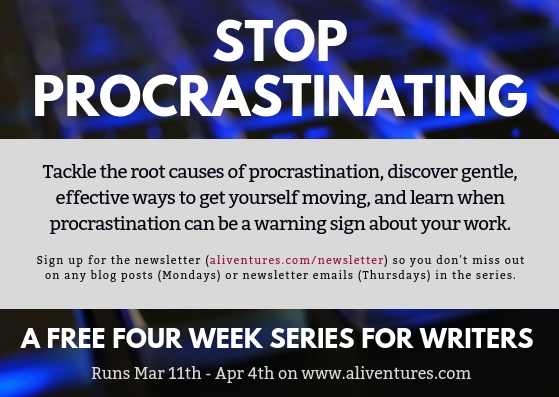 We’ve spent the past few weeks taking a deep look at procrastination, from the issue of why writers procrastinate to specific tips for staying focused (and for refocusing) when you’re writing. 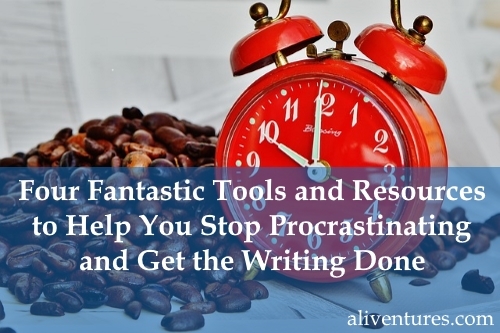 I wanted to cover all of this before sharing specific tools and resources, because it’s helpful to understand where procrastination is coming from, so you can develop ways to overcome it that actually work for you and your circumstances. However, I also think there’s a clear place for tools that help you focus on your work. If you’re spending a lot of your energy on simply “not procrastinating” or “trying to remember what I meant to do next”, that’s energy that you can’t use to actually write. I’ve kept this list short, as I’d much rather share a few great tools with you than a long list of so-so ones. Two of these are physical resources and two are software/apps. They’re all things I use on a very regular basis! Over the past few years, there seems to have been a bit of an explosion of planners onto the market. I wrote about four of them back in 2017 for The Write Life, and there are plenty more around. While planning in an app is fine if that works for you, I’ve found that planning on paper allows me to prioritise more easily and focus on big, important tasks — rather than on adding lots of little things to a list. 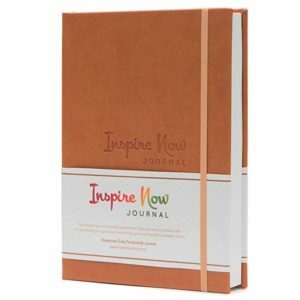 Do look around at different options, though, so you can find a journal that will work for you. RescueTime is an app that you can install on your computer or mobile device. It records what you’re spending your time on, minute by minute, throughout the day. If you suspect that you’re spending a wee bit more time on Facebook than you want, or if you tend to be distractible during writing sessions, flicking back and forth between a web browser and your actual writing … well, RescueTime will give you a very accurate picture. The free version is pretty full-featured, but you can’t use it to track time away from the computer, or to block distracting websites. The premium version, which is what I use, costs $9/month – you can do a 14 day free trial to see whether it’s a good fit for you. I bought this nifty little timer a couple of years ago, for my husband to use when working on his PhD thesis. 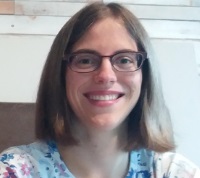 Both he and I have found it really helpful for timed writing sessions — and we also use it with the kids for things like timed tidying up, or for letting them know when their turn is up with a particular toy or game. 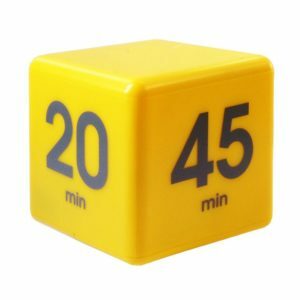 While there are obviously plenty of ways to use a free timer (with the clock app on your phone, or by going to Google and typing in “set a timer for X minutes”), the great thing about the cube timer is that it’s super easy to set and reset while you’re working. Just reach out and flip it to the appropriate side. There are different types of the cube timer on the market, and different interval lengths. The yellow one we have does 45 minutes, 20 minutes, 10 minutes, and 5 minutes. Beloved by writers around the world, Scrivener is a great tool for writing and organising book length projects (and I know a lot of people use it for other types of writing project, too, like blogs and scripts). You do need to pay for it, but there’s a generous free trial: you can use it for 30 (non consecutive) days – which means if you only write on a couple of days a week, you can use it for free for several months. I’ve found it well worth the money over the years, and I like being able to view my novel in “index card” mode, which makes it easy to see everything at a glance. It also has a full-screen writing option, which removes all the distractions (like toolbars etc) so you can just concentrate on the words themselves. There are also an awful lot of features I haven’t even tried out! There are plenty of tutorials online if you do want to dig deep into what Scrivener can offer. If you’ve not come across Scrivener before, or if you’ve heard of it but haven’t tried it, do give it a go. Is one of these tools a perfect fit for you? 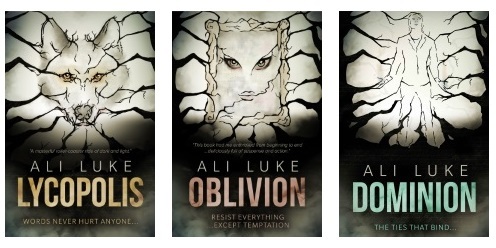 Or is there something else that you’d strongly recommend to writers who’re trying to stay focused? Share your favourites in the comments below. The final piece in the series comes out in this Thursday’s newsletter: make sure you’re signed up for the newsletter list to get it. Very useful.. I am a chronic procrastinator. Done it all my long life, and lost out on many things.. But when I start, I am very fast and good. The one thing missing in your piece is that procrastinators should know that they will be late, so start earlier than usual.. And experience the joy and unstressed life by being there in time..
We will never really get over it, but there are ways to survive.